Kuala Lumpur: A total of 1,100 high-performing Bumiputera small and medium enterprises (SMEs) to be developed into world-class players will be announced by October, Minister in the Prime Minister's Department Tan Sri Nor Mohamed Yakcop said. Under the High Performing Bumiputera SMEs (HPBS) programme, Unit Peneraju Agenda Bumiputera (Teraju), or Bumiputera Agenda Driving Unit, under the Prime Minister's Department, will start identifying outstanding SMEs to undergo an evaluation process. Known as Teras, the programme aims at increasing Bumiputera SMEs' participation in the economy by enabling them to scale up, accelerate their growth and compete in the open market, without heavy reliance on government contracts. "This programme will emphasis on developing quality Bumiputera SMEs that will in turn, trigger various business opportunities for themselves and other Bumiputera SMEs. It is the government's hope that these SMEs will be able to meet the target of 20 per cent contribution to the nation's gross domestic product by the year 2020," he said at the launch of HPBS programme yesterday. Nor Mohamed said the high-impact focused programme will see collaboration of various government agencies, government-linked investment companies and government-linked companies, as well as the private sector to provide business opportunities, talent and funding to selected Bumiputera SMEs. Teraju chief executive officer (CEO) Husni Salleh said in the first phase of the programme, the unit will pick out 1,100 Bumiputera SMEs, comprising the top 100 medium companies and top 1,000 micro companies, using clearlydefined criteria through an open and transparent process. The criteria include a minimum three-star SME Competitiveness Rating for Enhancement (SCORE) rating, a favourable credit rating by Credit Bureau Malaysia and ability to be profitable and grow. 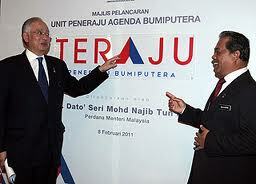 Husni said Teraju will announce members of the selection board, to be chaired by Teraju, soon. To ensure transparency and integrity of the process, Teraju will shortlist an independent local audit firm to monitor the overall selection processs. Meanwhile, SME Corp CEO Datuk Hafsah Hashim told Business Times that the agency has no problem identifying high performing Bumiputera SMEs from its database. Hafsah said about a third of 6,000 SMEs, including non-Bumiputera firms that SME Corp had evaluated, already have three-star SCORE rating. SME Corp will undertake an objective evaluation on Bumiputera SMEs identified by Teraju from other agencies' databases. In conjunction with the event, various memorandum of understandings (MoUs) were inked with parties like Teraju, Malaysia Technology Development Corp (MTDC), Perbadanan Usahawan Nasional Bhd (PUNB), Majlis Amanah Rakyat (Mara), Malaysia Venture Capital Management Bhd (Mavcap), Prokhas Sdn Bhd and SME Bank. The MoU provides for potential collaboration to create networking opportunities and the provision of business consultancy to create networking opportunities and professional services for Bumiputera SMEs. A general terms agreement signed between Malaysia Airlines and Airod Sdn Bhd looks at exploring potential cooperation between both sides in providing aircraft engineering and maintenance support, while Tenaga Nasional Bhd's subsidiary, TNB Integrated Learning Solution Sdn Bhd signed an MoU with Persatuan Usahawan Tenaga Malaysia for the sharing of technical expertise and collaboration on technical innovations. There was also a tripartite MoU between the government, PUNB and Mydin Holdings Bhd in the transformation of traditional retail outlets. MTDC, meanwhile, presented some RM55 million worth of grants and flexible loans to 26 innovative Bumiputera companies.